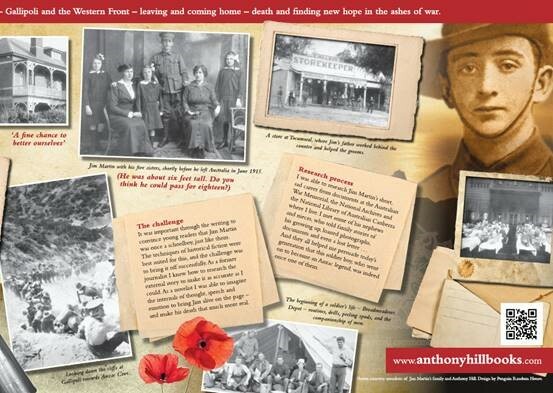 Canberra Library is going to host the Anzac Stories: Behind the Pages Exhibition in November to commemorate 100 years since WW1 ended on November 11. 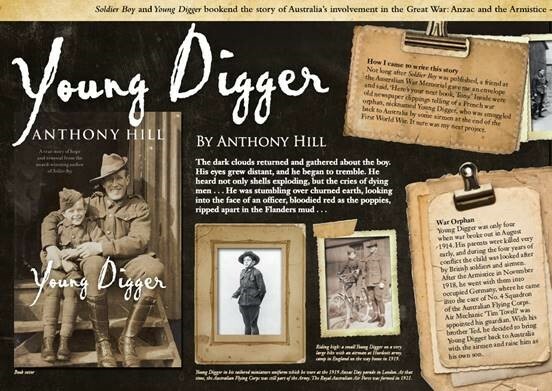 Local author Anthony Hill is going to join the exhibition with two displays: Soldier Boy and Young Digger - two Anzac stories written for 8-14 year olds. Hill's book is historically accurate. Teachers can feel confident that Soldier Boy is just about as close as you can get to an accurate historical representation in a novel form. Christopher Bantick, Canberra Times. Anthony Hill has pieced together a moving portrait of Jim's tragically short life based on the recollections of his family and letters he wrote home from the war. Greg Thom, Herald Sun. As a teenage Anzac, Jim Martin is seen as a figure to whom today's teenagers can relate ... perhaps we are now seeing John Simpson being replaced by Jim Martin, carefully chosen to appeal to a new generation and to continue the Anzac legend. John Connor, Australian Book Review. ... An exceptional addition to the children's literature of war. Kevin Steinberger, Magpies magazine. Read more about the two books here. 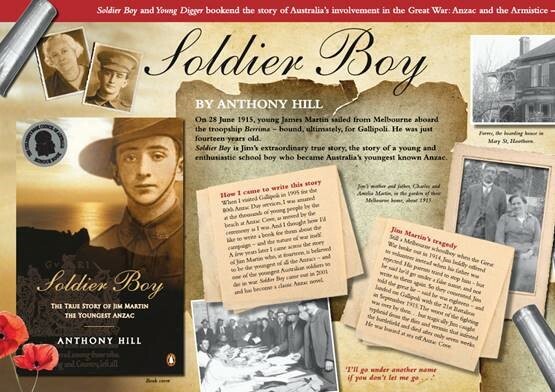 Buy Soldier Boy here and Young Digger here from Penguin Books direct.